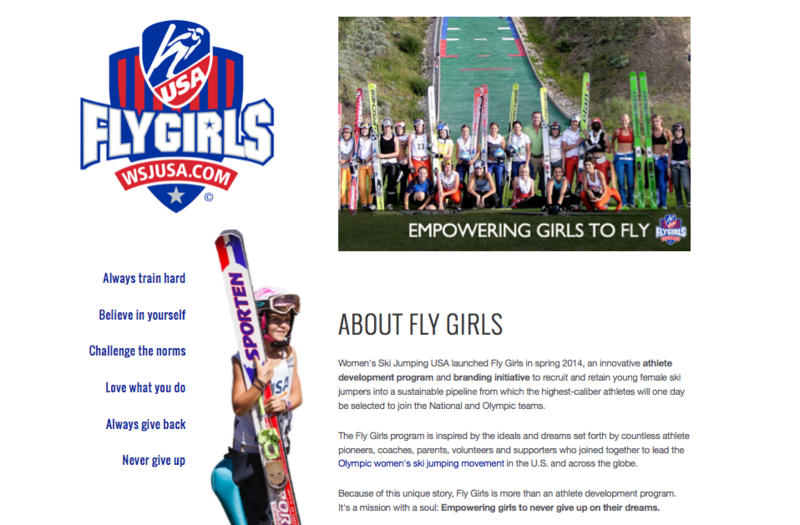 Landing page for the new Fly Girls Athlete Development Program. PARK CITY, Utah — Women’s Ski Jumping USA has announced an innovative athlete development initiative and program to recruit and retain young female jumpers nationwide into the sport. Fly Girls — as it’s named — is a junior team program that feeds athletes into a sustainable pipeline from which the highest-caliber ski jumpers will one day be selected to join the National and Olympic teams. Fly Girls launched today on wsjusa.com and the program kicks-off this summer with a five-week intensive training camp for rising stars in ski jumping ages 12-16. Gabby Armstrong, East Division; Kailey Bickner, Cara Larson, Mollie Immens and Hana Schrock of the Central Division; Samantha Macuga and Sophia Nester of the Intermountain Division; and Logan Sankey of the Rocky Mountain Division. WSJ-USA aims to raise $60,000 for the Fly Girls program by 2016. This year, the foundation has dedicated $20,000 to kick-off Fly Girls and is matching half of the $2,000-per athlete cost of the summer camp. WSJ-USA’s annual gala is July 17 in Park City, Utah, and will feature Fly Girls and the new “Adopt a Dream Mentor Program” in which a Fly Girl athlete and National Team athlete will be paired up for one year. The donation to support an Adopt a Dream pairing is $2,018 in celebration of the next Olympic Winter Games and comes with special Fly Girls and Visa Team perks. Gala tickets go on sale later this week. "As National Team members we are excited to see this great athlete development program take flight," said Sarah Hendrickson, 2013 World Champion. "We can't wait to see the next generation of Fly Girls coming up the pipeline." The Fly Girls logo was created by renowned designer Lindon Leader of Leader Creative , who also designed the WSJ-USA logo which debuted in 2012. Leader's portfolio includes the famous FedEx and Hawaiian Airlines logos and branding. The National Team (Visa Women’s Ski Jumping Team), which includes the top women ski jumpers in the nation who compete regionally and on the Continental Cup and World Cup tours, remains the cornerstone of WSJ-USA, a singular 501c3 organization. Collaboration efforts for recruitment, training, and shared resources are ongoing with USA Ski Jumping, the men’s national program.